In 2000, the Sea Turtle Survival League, a program of the Caribbean Conservation Corporation, continued its ongoing commitment to making Florida's sea turtle license plate a success by launching a year-long billboard campaign to blanket the state with at least 100 billboards that promote the sea turtle plate. Two different full-color designs were developed. The effort was made possible through a generous contribution from the National Save the Sea Turtle Foundation and free advertising space provided by the Florida Outdoor Advertising Association. At the launch of the campaign, CCC and staff from Florida's Marine Turtle Protection Program organized a billboard unveiling ceremony and press conference on the steps of the Florida Capital. A full-size billboard was erected at the entrance to the Capital, and media from throughout the state covered the event. 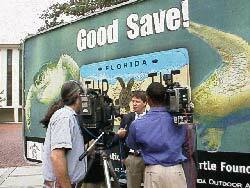 Executive Director David Godfrey speaks to the media about the purpose for the sea turtle license plate. Executive Director David Godfrey told the gathering that CCC and other Florida sea turtle groups had worked to establish the plate in order to provide a permanent funding source for the state's marine turtle program. By marketing the plate through TV and radio PSAs, posters and now billboards, the STSL is simply following through on its investment in the future of sea turtle conservation in Florida, Godfrey explained. "Now it is up to the citizens of Florida to follow through by purchasing one of these beautiful new tags," Godfrey challenged. "By doing so they can be directly involved in protecting some of the world's most important sea turtle nesting populations and their nesting habitats."